While talking about negotiable instruments such as cheques, bills of exchange and promissory note, we came across the terms holder and holder in due course, quite commonly. Holder refers to a person; we mean the payee of the negotiable instrument, who is in possession of it. He/She is someone who is entitled to receive or recover the amount due on the instrument from the parties thereto. On the other hand, the holder in due course i.e. HDC implies a person who obtains the instrument bonafide for consideration before maturity, without any knowledge of defect in the title of the person transferring the instrument. 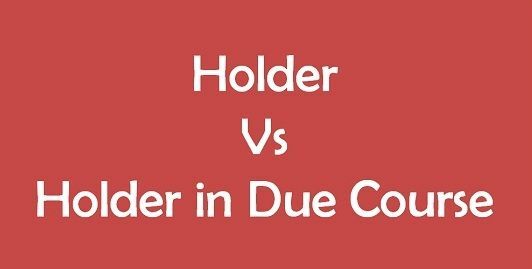 Take a read of this article in which we’ve simplified the differences between holder and holder in due course. Meaning A holder is a person who legally obtains the negotiable instrument, with his name entitled on it, to receive the payment from the parties liable. A holder in due course (HDC) is a person who acquires the negotiable instrument bonafide for some consideration, whose payment is still due. Right to sue A holder cannot sue all prior parties. A holder in due course can sue all prior parties. The instrument may or may not be obtained in good faith. The instrument must be obtained in good faith. Maturity A person can become holder, before or after the maturity of the negotiable instrument. A person can become holder in due course, only before the maturity of negotiable instrument. As per Negotiable Instrument Act, 1881, a holder is a party who is entitled in his own name and has legally obtained the possession of the negotiable instrument, i.e. bill, note or cheque, from a party who transferred it, by delivery or endorsement, to recover the amount from the parties liable to meet it. The party transferring the negotiable instrument should be legally capable. It does not include the someone who finds the lost instrument payable to bearer and the one who is in wrongful possession of the negotiable instrument. Holder in Due Course is defined as a holder who acquires the negotiable instrument in good faith for consideration before it becomes due for payment and without any idea of a defective title of the party who transfers the instrument to him. Therefore, a holder in due course. When the instrument is payable to bearer, HDC refers to any person who becomes its possessor for value, before the amount becomes overdue. On the other hand, when the instrument is payable to order, HDC may mean any person who became endorsee or payee of the negotiable instrument, before it matures. Further, in both the cases, the holder in both the cases he must acquire the instrument, without any notice to believe that there is a defect in the title of the person who negotiated it. A person who legally obtains the negotiable instrument, with his name entitled on it, to receive the payment from the parties liable, is called the holder of a negotiable instrument. A person who acquires the negotiable instrument bonafide for some consideration, whose payment is still due, is called holder in due course. A holder can possess negotiable instrument, even without consideration. As opposed to a holder in due course, possess the negotiable instrument for consideration. A holder cannot sue all the prior parties whereas a holder in due course, has the right to sue all the prior parties for payment. A holder may or may not have obtained the instrument in good faith. On the other hand, the holder in due course must be a bonafide possessor of the negotiable instrument. A holder in due course as against a holder enjoys more privileges in many situations like in the case of inchoate instruments, fictitious bills and so on. A person can become a holder, before or after the maturity of the negotiable instrument. On the contrary, a person can become a holder in due course, only before the maturity of the negotiable instrument. After reviewing the above points, it is quite clear that a holder and holder in due course are two different persons. Further, a person needs to be a holder first, to become a holder in due course, whereas, in the case of a holder, he need not be an HDC first.